It’s been a busy first quarter here in Lady Writes Land. I’ve had some amazing opportunities and worked with some brilliant brands on my Valentine’s Day and Mother’s Day Gift Guide’s. I also wrote a blog post called The Girl Boss Generation which is probably my favourite post this year, in response to some of the disagreements that have arisen in the blogasphere recently. I also started working with Pick A Blogger as the contributor for The Blogger Series which is a series of posts designed to help other bloggers get the most out of their blog. And I’ve already got some BIG news coming for the next quarter (which I can’t share just yet as I’m still ironing out the details) but overall it’s been a brilliant start to 2016! Last month I finally ticked off a big thing on my 2016 Bucket List – I cut my hair off. A lot of it. I had hair down to my bra and cut it to my jaw line…so it was a massive change! But I’ve had short hair before, and had been toying with the idea of cutting it again for ages, when I finally took the plunge and did it! Well, my hairdresser did. (The only time I cut my hair, it was so traumatic that I’ll never go near my locks with scissors myself ever again!) I couldn’t be happier with my new look, it’s given me a much needed confidence boost. I feel like this is a year of doing things for me, and it’s made me feel empowered – funny how a fresh hair-do can do that to a girl! The lovely folks at Lip Smackers sent me a set of their latest yummy lip balms and I’m blown away. Each of the eight different balms is scented exactly like a yummy Starburst AND they taste like them too, which is even better. I’ve never had a lip balm that’s scented and flavoured before, but let me tell you, these motivate me to keep my lips nice and moisturised. They also have a nice glossy finish but without the stickiness of a lip gloss, which is perfect for the wintery school runs. They’ve been my favourite fun discovery and you can get them from Claire’s for £12 and they’re worth every penny. I shared a picture on Instagram recently of a beautiful initial candle that my lovely friend gave me. I’m a huge fan of everything alphabetised right now and the whole monogram thing has also been big for ages, especially in the home decor world – so the candle was a pressie that gave me a BIG smile. Initialed items are everywhere and bang on trend, and I’m especially loving the Next range – which coincidentally, is where the candle came from! What road trip would be complete without a little splurge in Victoria’s Secret hey? Well, that was my exact thought when I popped over to Birmingham a few weeks ago. I really didn’t want to buy anything, honestly I didn’t, but it just happened. And two items and £50 later I emerged with my trademark pink stripe bag. I’m a bit hooked on the pink and white VS stripes so treated myself to a two pack of toiletry bags and matching phone case…both were complete treats but also items I’d wanted for a while. So forget “When in Rome” it was more like “When in Victoria’s Secret” for me! So, at the beginning of February I took another plunge and booked my first solo trip to New York! The destination at the top of my Bucket List, I really feel like this is my year for taking action and doing the things I want to do – rather than waiting for ‘better’ or different circumstances in which to do them. I’ve already started planning the things I’m going to do while I’m there and don’t even know if my booked week-long trip will be long enough. 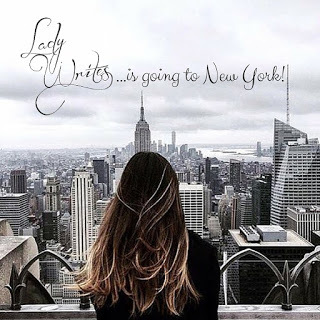 You can read about what made me book the trip in my Lady Writes Is Going To New York blog post. 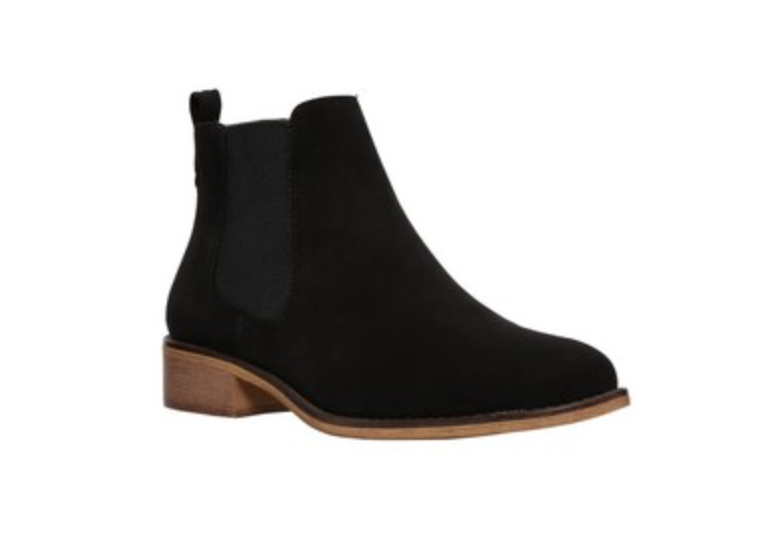 My absolute bargain buy and best fashion purchase recently, has to be these a pair of gorgeous Chelsea Boots from… Tesco! I saw them on a flying visit through my local store and couldn’t resist picking them up – even though I’m on a strict budget thanks to the above. But considering they came in at £20, they were such a bargain that it would have been rude to refuse! I love suede boots and although I don’t often wear flat ones, the style of these were bang on trend and they go with everything whether it’s jeans or skirts/dresses with tights. I intend to wear these flat out…see what I did there?! Also, I love the whole ripped jeans vibe right now. In fact I’ve gone a bit trigger happy and started ripping up most of the jeans I own…oppsie. However, I wanted some black ripped knee jeans but didn’t want to spend a fortune. So, I got my DIY thang on and bought a £12.99 pair from H&M and watched a YouTube tutorial on how to do it yourself…it could have been a total disaster but I absolutely LOVED the outcome. FYI the knack is to make a small cut with scissors, rip the rest of the way and then…wait for it…use a cheese grater on the edges to fray. Who knew a cheese grater would be a fashion must this spring?! As ever, Instagram has my heart. I’m working hard to create consistency in my theme on Insta, but while also retaining some level of spontaneity that doesn’t restrict my posts too much. 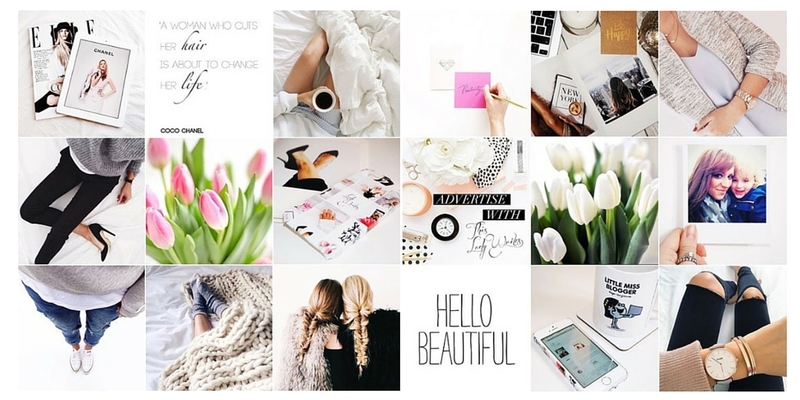 I’m also working on a strategy post for The Blogger Series on how to maximise results on Instagram as a blogger, so watch out for that, it’ll be coming soon! Here’s a snapshot of my Insta feed, follow me here.